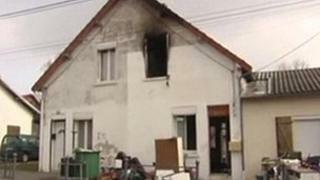 Five children have died in a house fire in northern France. The blaze in Saint-Quentin, about 130km (80 miles) north-east of Paris, was probably accidental, reports say. The children's father was present but escaped with serious burns, local officials said. Three people were also killed and 13 hurt in a fire in the Paris suburb of Aubervilliers on Saturday. Officials suspect the fire was "of criminal origin" and an investigation has begun. Officials said that the blaze in Saint-Quentin began at around 22:30 local time (21:30 GMT). The father had been looking after the children for the first time since splitting up with his wife three months earlier, a neighbour told French media. He tried to reach his children but was beaten back by the flames and jumped from the first floor of the building to raise the alarm, reports say. But by the time emergency services arrived, the building was not safe to enter and the children's bodies were discovered when the fire had been put out. The flames "severely hampered the firefighters' work", local official Jean-Jacques Boyer said. The children's bodies were eventually found and they had died of asphyxiation, he added. Four of those injured in the Aubervilliers fire were in a serious condition. Around 60 people were reported to be in the seven-storey building when the fire began. "The fire was probably of criminal origin, it looks like it was a settling of scores," the mayor's Chief of Staff Michael Dahan told TF1 radio. Aubervilliers' deputy mayor for housing, Evelyne Yonnet, told French media the building was "very badly managed, with a squatting problem". Those who escaped from the building were being temporarily housed in a local gymnasium, reports say.